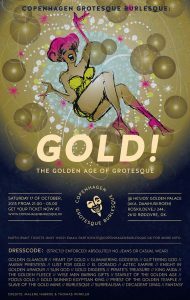 Glamorously, grotesquely, the gilded glittering guys and gals gallantly glide around the garish gala that is… Copenhagen Grotesque Burlesque: GOLD! The Golden Age of Grotesque. We invite you to a night of gold fever, the shimmering allure of gold causing a gold rush, a madness spreading throughout Damhuskroen as all guests, clad in this most decadent of materials, merge into a sight that is awe-inspiring, like descending upon a room of buried treasures, each with its own story of epic adventure and intrigue. We invite you to dive right in, swim through the gold coins and crowns, through fool’s gold and ancient artefacts, through the Incan and Aztec and Edwardian and Chinese gold and all the golds of world, the aurum, the very element of gold itself. You transform, you yourself become gold, you shine from within, and your costume emanates a golden glow, your participation plays with the stories and (mis)adventures of gold throughout the ages, and the garishly golden gala becomes a crazed celebration of The Golden Age of Grotesque.